Subscribe to get full access to this operation and the extensive Hip Surgery Atlas. Learn the Salters’ osteotomy surgical technique with step by step instructions on OrthOracle. Our e-learning platform contains high resolution images and a certified CME of the Salters’ osteotomy surgical procedure. The Salter osteotomy is a redirection osteotomy where the iliac (innominate) bone is divided from the sciatic notch to the anterior inferior iliac spine. 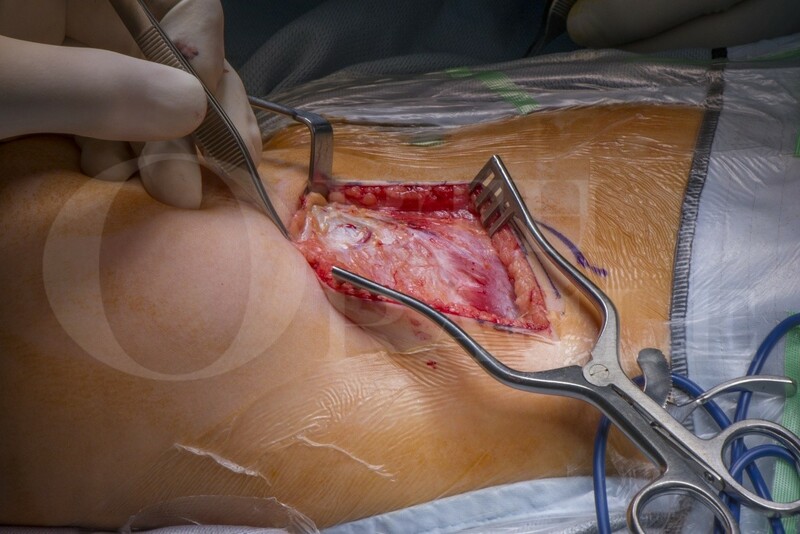 An opening wedge osteotomy is performed inserting a triangular graft harvested from the iliac wing. The osteotomy results in improved anterolateral coverage of the femoral head as the distal fragment hinges on the symphysis pubis and SI joint. Unlike an acetabuloplasty which reduces the volume of the acetabulum, the Salter osteotomy is purely redirectional. Although the operation may be performed in isolation it can be performed concurrently with an open reduction of the hip for late presenting hip dislocation. The operation was originally described for children aged 18 months and above. It has been utilised for the treatment of acetabular dysplasia in adults but in this age group has been largely superseded by periacetabular and triple pelvic osteotomies.